Our French breads are some of the most versatile breads we make, and are absolutely delicious. Some popular uses include French toast, dinner bread, subs, heroes, and classic garlic bread. Our large French breads are also a banquet favorite, so whether you're cooking for 200 or simply making a sandwich, this is the product for you. If you are looking to send a sub or hero out of the kitchen with a little bit of a special look, then here are five great choices. Each has a slightly altered look from one another, but all have the same delicious taste and perfect texture. These also work well as a table or basket bread. 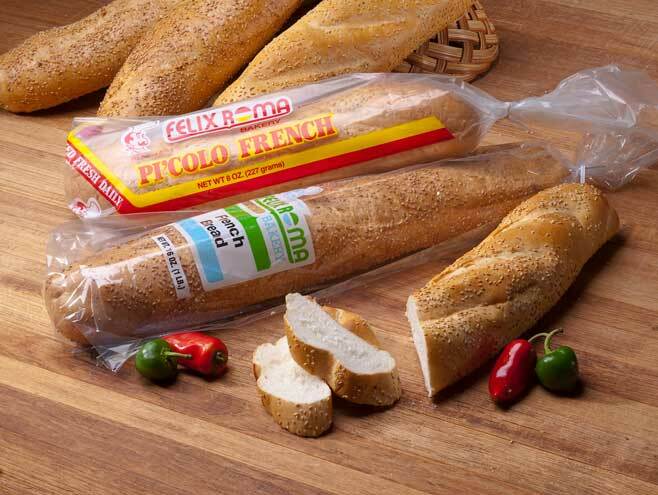 "Piccolo" is the Italian word meaning small, so when we needed to come out with a smaller version of our French bread many years ago, the name came to us easily! Measuring a little over half the weight of our traditional French bread, this loaf gives you the option of using it for subs and sandwiches.